Lactescence means the state of producing milk. Mother’s own milk is the most precious and enduring gift that can be given to a baby. When it is given directly from the breast, the close contact between mother and baby provide an opportunity to enhance their bonding. Babies are hard wired with reflexes to breastfeed. Mothers are not. While the physiologic process of breastfeeding is normal, there are many aspects of breastfeeding that are learned. In the past, mothers intuitively learned by watching breastfeeding from the time they were young. Mothers often had access to an extended family network. Family members, friends, the wider community were familiar and comfortable with breastfeeding as the normal way to feed infants. Health care practitioners had more experience resolving breastfeeding problems. Historically, the research has always shown that infants (and all mammals) who need to be fed artificially are more vulnerable, more at risk. Over time, better research methods and thousands of studies have defined those risks more clearly. Yet speaking of these risks often makes us uncomfortable or defensive because many of us were not breastfed or encounter difficulty breastfeeding our own infants. The reasons for our discomfort are seeded in the fact that several generations of women were actively discouraged from breastfeeding. During this period, marketing perpetuated and reinforced many misconceptions about infant feeding. The family norm shifted from “extended” networks to “nuclear” isolation. Family members, friends, and the wider community became accustomed to artificial feeding. Health care practitioners adopted protocols designed for artificial feeding. As a society, many of us forgot how to feed infants normally. The support structures have not yet been fully reprogrammed for breastfeeding. Is it any wonder that a fair number of women now struggle? Telling mothers that breastfeeding is natural doesn’t help when they encounter problems. This attitude dismisses the challenges and devalues the enormous efforts women devote to learning how to breastfeed and care for their infants. Too often we have a benign image of nature. Nature is not always kind; it is indifferent. Instead of platitudes, mothers need empathetic, pragmatic, and individualized solutions during this phase of returning to more normal infant feeding. 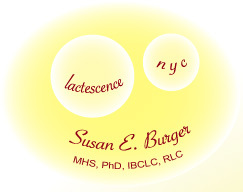 The spirit of Lactescence is to assist mothers to create a healthy infant feeding relationship within a modern society that is as close to “normal” as possible.